Nestled on a hillside close to a serene lagoon along the southeastern shores of Thailand's third-largest island, the Kamalaya Koh Samui, Wellness Sanctuary & Holistic Spa has created a secluded, spiritual haven that immerses guests in the beauty of its surroundings—ancient granite boulders, open sea views, natural streams, and lush vegetation. Offering an unpretentious, communal atmosphere, the ten-acre property is dedicated to providing a holistic wellness experience through nutritious cuisine, individual and group wellness programs and fitness endeavors, and healing spa therapies inspired by both the East and West. Amenities include a steam cavern, a Buddhist monk cave, and swimming pools surrounded by lotus ponds, overlooking the ocean. Of the 75 guest accommodations, three are private villas set on the beach, two of which have private pools. The spa at Kamalaya offers more than 70 holistic rituals and therapies celebrating Eastern and Western medicines in over 30 treatment rooms, including four dual suites and three massage salas. Spa amenities such as the plunge pools, steam cavern, and relaxation areas are outdoors, affording picturesque vistas of the local landscape. The spa's menu of services features massage and body treatments, including Chi Nei Tsang, as well as traditional Chinese medicine, Ayurvedic rituals, homeopathy, naturopathy, sound healing, colonic hydrotherapy, hypnotherapy, cranio-sacral therapy, and more. Guests can partake of one of 12 core wellness programs—the Detox & Rejuvenation program is the most popular—or opt for a customized program tailored toward guest's specific needs. All stays and wellness programs begin with an initial complimentary consultation with a naturopath. 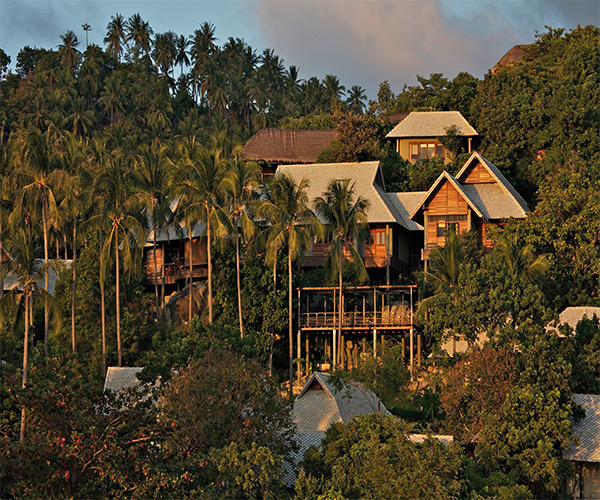 Keeping in tune with its holistic wellness approach, Kamalaya provides an extensive list of fitness pursuits. The 120-square-meter exercise center features LifeFitness equipment, free weights, and weight training equipment, and a good number of workout classes are available, including daily Pilates, yoga, and qi gong. Group meditation classes are offered a few times per week; private meditation, emotional and spiritual healing, and counseling can also be arranged, as well as personal training sessions. Aquatic facilities include lap and freeform swimming pools. At the heart of Kamalaya is its ancient monk's cave, where guests can spend quiet moments in reflection or meditation. Guests can also enjoy weekly "Make a Wish" Floating Lanterns ceremonies performed on the beach. An on-site art gallery showcases the work of local artists. On offer are 59 guest accommodations, scattered throughout the nine-acre grounds. For a more secluded stay, guests can reserve villa accommodations, enjoying sea views from a private balcony with a daybed. The Rock Top Villa offers a unique design aesthetic, with a natural rock wall, high ceilings, open sitting areas, and wooden pillars, while the Pool Villa, offering expansive ocean vistas, is appointed with a private courtyard and shaded pool. The two-bedroom Beach Front Pool Villa, surrounded by thick greenery, also has a private pool overlooking the ocean and is great for guests traveling with family or a group. 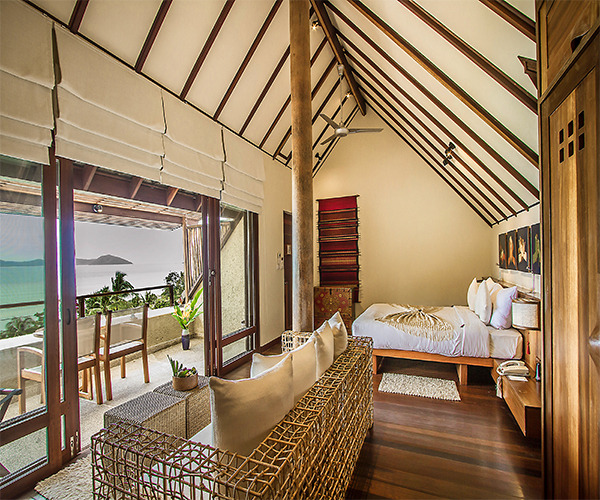 and the one-bedroom Beach Front Pool Villa offers similar accommodation for singles or couples. Guest rooms come outfitted with air-conditioning, CD and stereo systems, refrigerators, in-room safes, Internet connection, and yoga mats. Kamalaya's three dining establishments—Soma Restaurant, Amrita Café, and Alchemy Tea Lounge—feature seasonal, nutritious fare showcasing the culinary influences of the East and West. Guests can choose from a healthy menu of fresh seafood, poultry, and lamb dishes, or sample fresh juices, signature tonics, and herbal refreshments. Guests following the spa's detox program are provided with a wide variety of vegetarian dishes that are low allergenic, low inflammatory, and low glycemic.